Where is the Green Sheep? by Mem Fox (with illustrations by Judy Horacek) is a favorite amongst our therapists for their sessions, as well as being much-loved by the children who read this book! 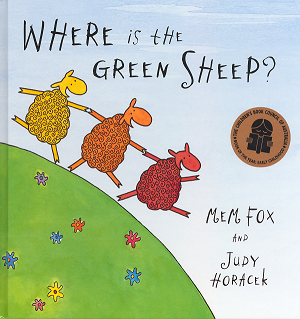 This is an exciting and interactive story focusing on finding a ‘green sheep’. For parents, this book is simple and quick to read, however it’s jam packed with skills that can be taught to children of all ages, such as listening, language, speech and cognition. How amazing! Children love turning the pages to find out what sheep comes next and this fosters other language and cognitive skills including, prepositions (“on”, “next to”, “in”), adjectives (“brave”, “scared”), verbs (“wave”, “jump”) and colours (“green”, “red”, “blue”). Speech and listening skills can be developed whilst enjoying this special time with the little ones! Parents can also use auditory verbal therapy strategies, for example acoustic highlighting (emphasizing key words wanting to be taught) and auditory closure (reading parts of the sentence and leaving words off for children to complete). Where is the Green Sheep? can be read countless times and still be enjoyed. The rhyming, repetition and quirkiness make it a hit with toddlers and a particularly popular bedtime read.